The nature and speed of National Action’s escalation towards violent extremism suggests they may have in part been reacting to Islamist violent extremism. The group integrated anti-Muslim rhetoric into prevailing narratives about ‘race war’, anti-Semitism and ‘white rights’. Their rhetoric included incitement to ‘learn from enemies’, reflecting a strategic, instrumental response. Equally, there are indications that their escalation arose from competition within the Far Right. This may suggest reciprocal radicalisation ought to be considered as a movement-wide phenomenon. A small and extreme ‘groupuscule’, National Action first appeared online in September 2013, and were proscribed in December 2016. There have been various off-shoots since then, such as Scottish Dawn, NS131, and suspected others e.g. System Resistance Network. Two separate trials commenced in 2018 against eleven suspected members. One of these, Jack Renshaw, has admitted preparing a terrorist act and threats to kill against his MP. At least one of those charged had been a member of the Armed Forces reservists, and Renshaw had also attempted to join. National Action were linked to a series of severe incidents, some directly, others indirectly through individual members. These included: an attempted beheading; death threats against Liverpool’s Mayor and MPs; possession of pipe bomb by a 17 year-old; street violence; and glorification of the murder of Jo Cox MP. Key theoretical approaches include Busher & Macklin’s 2014 recommendations to advance research into Cumulative Extremism. 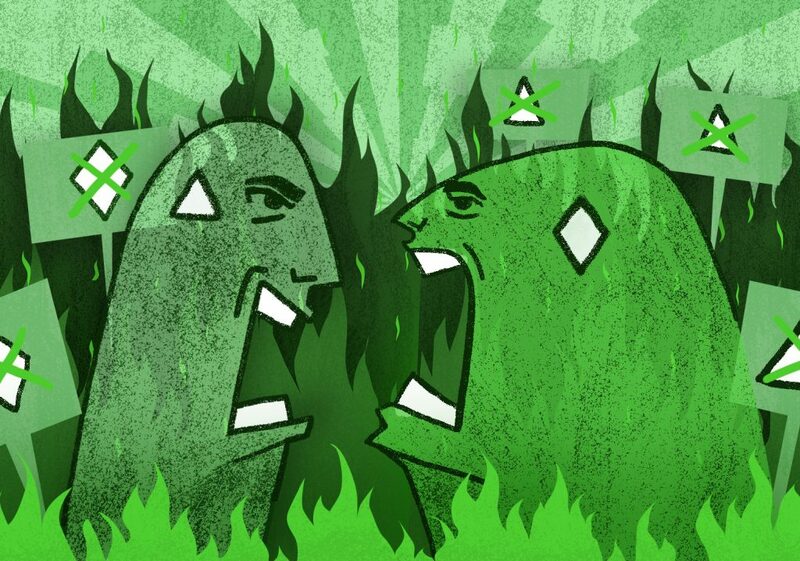 The current case study sought to build on three of their recommendations by examining: the relationship between the “spirals of violence”, and wider processes of “community polarization”; the ebb and fow of interactions between the opposing “extremist” groups; and how movements and countermovement’s are coupled. National Action appear to represent a loosely coupled, one-sided spiral towards violent extremism, in that there is limited evidence of Islamist responses to their escalation. Other key approaches include Donald Pratt’s ‘Impositional Extremism’, where groups frame extremism as justified or necessary in response to other groups’ extremism, and Paul Jackson’s concept of ‘Accumulative Extremism’ developing over time. The current case-study examined website pamphlets, leaflets, videos, articles and online interactions, accessed through open source material via Wayback Machine. These were cross-referenced with news sources, government reports, and reports by groups such as Hope Not Hate, Searchlight, and Tell MAMA. An instrumental response was apparent in the group’s articles. This included use of existing extremist narratives to shape their own, in particular through reference to ‘white jihad’ and ‘white genocide’. This included comments such as “The role of the White Jihad is … a signal that … we are open challengers to the system… “, and “Every generation needs something to fight for.” Analysis of one such article following the 2015 Paris attacks found 88 references to Islam/ Muslims, compared to 288 to Jews and Judaism. In reference to Islamist attacks, they commented “For us a better state of affairs could not possibly exist and we need to take it for what it has become; a blessing in disguise.” This suggests calculated attempts to reframe Islamist terrorism into justification for a focus on race and ‘race war’ and seeking to gain from such events. They also expressed admiration for Islamist terrorists. Violence was framed as evidence of commitment. They shamed their members for not showing similar ‘commitment’, for example “Fascism produced people who were willing to fight – who is really willing to fight for anything today? … Muslims are an example, they strap bombs to themselves.” They also admired Islamist extremists being ‘masters of propaganda’. They routinely exploited negative mainstream coverage of Muslims, building on members’ existing hostility. Violence was central to the group’s ethos and communication and was presented as inevitable and celebratory. The group also engaged in paramilitary training. Many members had prior involvement with weapons, violence or offending. This included weapons possession (Benjamin Raymond, Wayne Jarvie), serious violence (for example Stephen Durmont), false imprisonment and sexual assault (Ryan Fleming), hunt sabotage (Ashley Bell), and violence and burglary (Joshua Bonehill-Paine). Yet much of the most serious violence committed in the name of the group was carried out by less entrenched members. This underlines Horgan et al’s 2016 assertion that “the concern needs to perhaps be as much on those who are involved in the wider network, as those who commit actual acts of terrorism,”. The group’s online rhetoric centred on Neo-Nazism and anti-Semitism, whilst their street activity was primarily anti-Muslim and anti-refugee. They frequently visited areas with high levels of past BNP support e.g. Rotherham, Doncaster, Leeds. An analysis of sixteen demonstrations and non-violent events found they primarily referenced issues such as Brexit, ‘the white race’, hatred of Muslims and refugees. There was very limited reference to anti-Semitism. Five of the sixteen incidents arose within one month of serious Islamist attacks. This suggests that whilst there may have been instances of decisions to act as a planned response to such attacks, the evidence is more indicative of longer-wave escalation, rather than short-wave retaliation. Anti-Semitism featured in half of the incidents studied. Other recurring themes included Nazism, hatred of Muslims and immigrants. Alongside strategic responses to Islamist extremism, the trends discussed here suggest competition with other far right groups. This includes the ways they tried to differentiate themselves from other groups, and negative rhetoric about other the rest of the Far Right. Conditions such as negative mainstream narratives about Muslims/immigrants, movement of extremists between far right groups and competition within the far right appear to have compounded this impact. 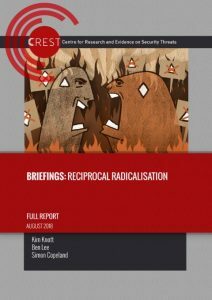 Overall, the findings from this case study suggest that there was a discernible response to Islamist violent extremism, with an instrumental, strategic approach from the group. This involved making use of Islamist extremist events and narratives to recruit and promote violent extremism amongst members. Further research is needed into individual responses to such a dynamic to better understand the ways in which this may have increased the member’s willingness to use violence. Samantha McGarry is studying for a PhD at Lancaster University. Her research is focussed on seeking to improve understanding and conceptualisation of the inter-relationships between Lone Actor Terrorists and extremist networks. Prior to commencing her PhD, she worked as a Probation Officer for twelve years, supporting desistence in violent offenders, including those with extremist values. Jackson, P.(2014) Accumulative extremism: the post-war tradition of Anglo-American neo-Nazi activism In: Jackson, P. and Shekhovtsov, A. (eds.) The Post-War Anglo-American Far Right. Basingstoke: Palgrave Macmillan. pp. 2-37.